I'm gonna share an application (app) which really blew my mind. It's so efficient; I wonder why no one came up with it earlier. It took literally less than 5 minutes to download [on your smartphone] and register. Just type in your name, e-mail address and telephone number. You're registered and can use the service IMMEDIATELY. This is a big deal, because I don't drive. And, hailing cabs are a big ordeal in KL. Not to mention the safety issues. With this apps, you just need to key in your destination and the cab will come in no time. The good thing is, you would have the record of the driver in any case. The name, phone number, plate number. The app also will track the taxi. I highly recommend this application. 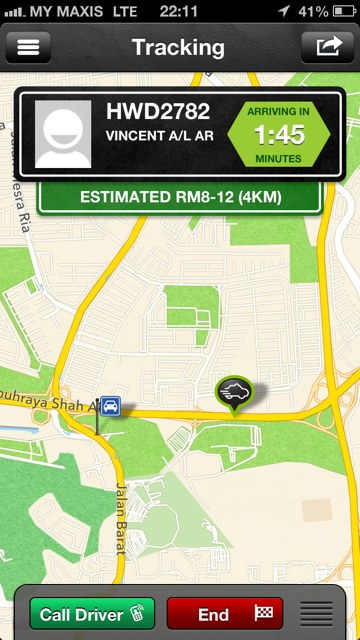 It will ease the cab hailing process and ensure your safety, too! *It is available for both iPhone and Android platform.